The giant of Kobelco Generation 10 excavators, SK500LC-10, leads the way in performance with exceptional green credentials. Kobelco Construction Machinery Europe B.V. (KCME) is pleased to announce the arrival of its latest version of the 50-tonne conventional earthmoving and construction excavator SK500LC-10. This latest Generation 10 machine incorporates many new detail changes but is particularly marked for being designed to provide exceptional low emissions and increased working performance to maintain unparalleled working efficiency. 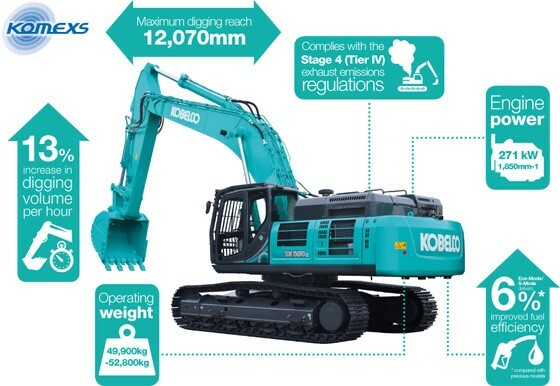 The SK500LC-10 is also the latest Kobelco excavator to comply with the Stage 4 (Tier IV) exhaust emissions regulations. For media enquiries and the full press release please contact Branding and Communication Group by email marketing-eu@kobelconet.com.